KRISTIN ROSE KELLY is a director and documentary theatre maker. Her artistic projects always intersect with specific communities and frequently explore gender and sexuality. Her work in the docudrama realm has been influenced by working with Matthew Francis, protégé of Anna Deavere Smith, Ping Chong & Company, and Dance Exchange. Kristin Rose Kelly is a current artist in residence at University Settlement with, Creative Traffic Flow. Original work includes Duets of Difference: a dance-theatre piece exploring disparate community identities and Voices from the Roanoke River: an original documentary play about the community members who want to protect it. Her original documentary play about women in Engineering, A Chip On Her Shoulder has performed at NYU, City College, Queens College, Brooklyn College, Virginia Tech, and Virginia Western Community College. She also premiered Engineers Not Found with Honest Accomplice Theatre last month which features interviews from A Chip On Her Shoulder. 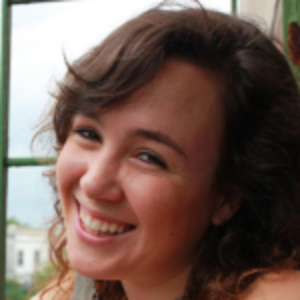 She has worked with Talking Band and Sarah Cameron Sunde.. Kristin received her MFA in Directing and Public Dialogue from Virginia Tech and BFA in Musical Theatre from Syracuse University. I am queer and feminist director with the heartbeat of a musical theatre performer. My work usually examines gender and sexuality and always considers music, dance, and song as crucial elements of expression. I am a documentary theatre maker. I love diving into theatre as research and then presenting the documentary material in the most theatrical way possible. I am a big thinker and learn a lot about performance through women and gender studies and performance theorists. Some of my favorite theorists are Jose Munoz, Stacy Alaimo, and Adrienne Rich. I really want to learn Spanish! Always offer metrocard swipes or open the emergency door to let other into the subway. Listen to podcasts on the train and music when walking. 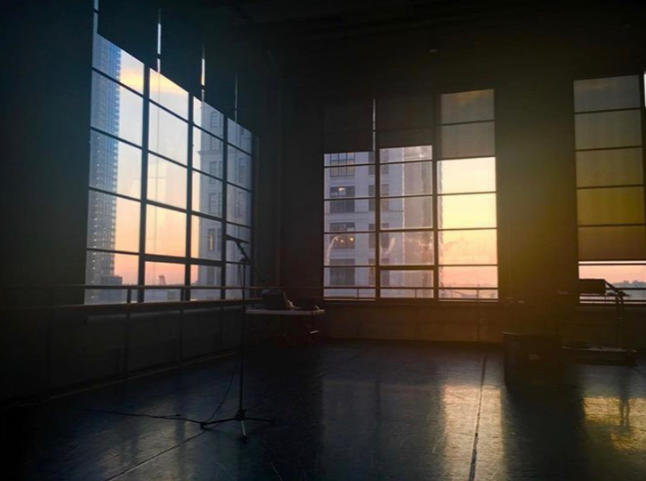 My Pic of the Day: I took this photo working on 36 PEAKS as an assistant director for Sarah Cameron Sunde at Baryshnikov Arts Center. The studio was so amazing to work in because the windows kept a strong connection to the outside world. I think New York is a machine and most of the time I love that. When I walk out the door I feel a part of a cog where people are moving and trying every day. I grew up in Burlington, Vermont where there was so much opportunity for calm meditation surrounded by lakes and mountains but I have always wanted to feel connected to humanity and community and I am fueled by the good, bad, and ugly of that in New York. Favorite breakfast meal & restaurant? I like ringing into my corner bodega’s landline and ordering a sesame bagel toasted with light cream cheese. At least one coffee. If I can afford it, a kombucha. Good for the gut. Instagram for sure. I love all the astrology accounts and just stanning for my friends. I like walking the bridges in the city by myself and a bookstore when I have the time. I love McNally Jackson and the small NYPL on Jersey Street. I learned that once you really understand what you can offer as an artist and what you are personally interested in, it will be much easier to seek out mentors and jobs because you will be able to connect on your passions and skills. I work with a lot of artists who want to make real connections and work with non-arts partners and communities. I am excited by the possibilities of theatre in support of bigger conversations for communities, for the environment, for social justice. Share excitement! Share your passions! Really explain your ideas or goals and then listen! Be open to how your collaborators can make your project even better!